Sekiro: Shadows Die Twice has a lot of big bad guys, but one of the most antagonizing opponents you will face is the giant snake. Officially named the Great Serpent, this beast is a terrible opponent. It must be sneaked pass repeatedly, until you have found a way to safety. 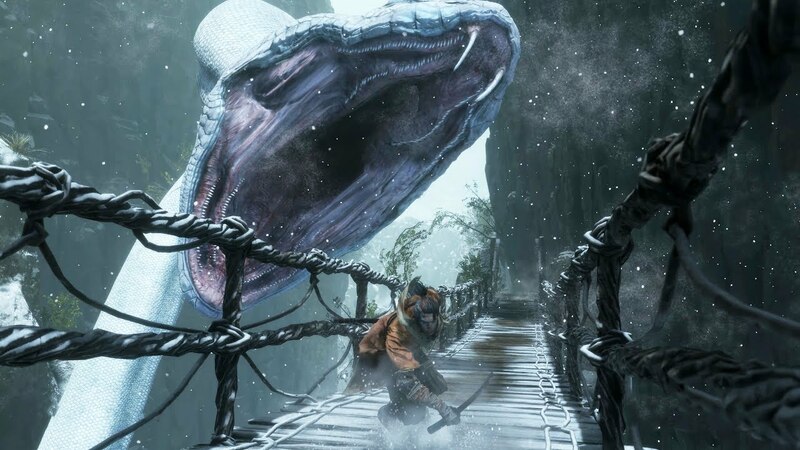 Once you reach the bottom of the Sunken Valley passage, you will encounter another giant snake that blocks your path to Ashina Depths. This is actually an independent giant snake, and even if you have killed the first one, it will cross your path. Either way, the giant snake in the cave won’t move. If you try to run or hug him, it will attack a huge damage. Fortunately, there is a way to go beyond him, but it involves a certain upgrade and some tricky work. In this guide, we will teach you how to defeat the giant snake in the cave in Sekiro: Shadows Die Twice. The giant snake in the cave will be discovered shortly after the Toxic Memorial Mob merchant who was passed through the sinking valley. You need to pass through a few sour spit lizards and ghostly wall enemies (you can mikiri counter them), but once you know the route, it is easy to sprint to the big snake. As with other giant snakes, you need to find a way to be unnoticed here, but to do this, you will need ninja puppet technology. This technique was acquired by defeating the Folding Screen Monkeys in Senpou Temple and allowed you to animate the bodies of your back stabs. If you haven’t already done so, beat Genichiro Ashina at Ashina Castle and head to Senpou Temple for a deadly blade. You don’t actually need to get a deadly blade, you can only beat the folding screen monkey, but there is no real reason not to pursue it. Either way, once you have the Ninjutsu Puppeteer technology, go back to the snake and then descend from the left ledge to the platform below. Follow this, climb up or jump on the wall to the platform with the curled monkey. Don’t worry, you don’t need to be invisible here, the snake won’t care unless you are on the platform, which he guards. Make sure you are equipped with Ninjutsu Puppeteer technology, then backstab the monkey and activate the technique. Then, the zombie monkey will jump into the alcove on the left and start dancing, seeking the attention of the serpent. Once the snake stabbed the monkey, he will take the main road and enter the temple. Snake’s body will hit the wall behind you and block the path. Don’t attack it, otherwise it will slam again, and if you hit it, it will cause huge damage. Unfortunately, you can’t actually kill this particular snake, so you just have to let it slide. Inside you will find the dried snake viscera that will be very useful for your storyline in the future.